One year ago today, I was struggling. I was struggling to find my purpose in this world. Struggling to find something meaningful to invest my time, my energy, and my life into. I so desperately wanted to do something to make the world a better place. It was my dream. I had had dreams in the past. Some seemed impossible, so I ignored them. Others, I started working towards and at the first signs of opposition or doubt, I gave up. 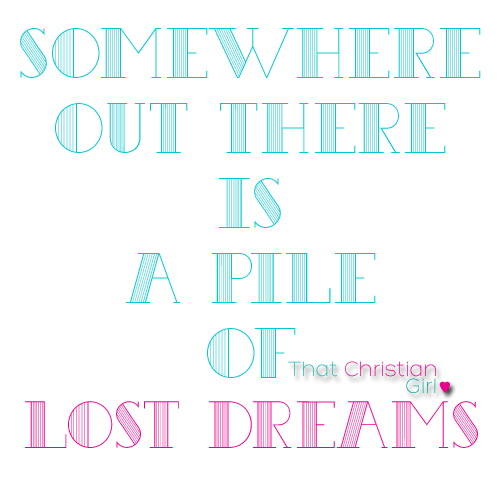 Somewhere out there is a pile of lost dreams. Hopeless failures. I’m sure you could imagine how I felt when God gently urged me to start a blog for young women like myself. I was scared. Scared of what people might think. Oh, another blog? This girl needs to make up her mind and just stick to one thing! OR She’s just trying to copy off of other girl blogs like She Has Worth, TheFullTimeGirl, and Project Inspired. Scared that this dream would end up on my pile of failed dreams, too. Not only was I scared of failure, but I was scared of success (weird, I know). What if people actually like this blog? What then? What steps do I need to take? What is God wanting for this dream? After a time of prayer, I decided to take the leap of faith. I didn’t know what to expect. I didn’t know what I was getting into. All I knew was that God gave me a dream – a dream that was too hard to ignore. The more I prayed, the more my passion grew for That Christian Girl. The more I sought His face, the more God showed me His vision for this ministry. The more I began to believe in this ministry, the more I began to see your faces. The longer I stayed faithful and true, the closer we have grown as a community. The more I prayed with you, the more I realized how much we all need Jesus and each other. Most of all, you have inspired me. You have inspired me to become the best I can be. To be a Godly example. To share my heart and the hearts of other young women with you. You helped me to believe that when God gives you a dream, it shall not fail. When you commit to follow through with God has purposed for you, nothing can take that away. Sure, people may talk about you. They may try to talk you out of it or talk you down. When God gives you a dream… No one can steal it. No one can destroy it. No one can carry it out better than you because YOU were destined for this purpose! When God gives you a dream… Do not give up. Do not be discouraged. Do not let the fear of failure keep you from pursuing what God has called you to pursue. He’s already made a way! When God gives you a dream… Pray. Fast. Write down what He’s telling you. Keep a journal of the progress you’ve made. Journal your thoughts and prayers. Put in writing what God has placed in your heart. Write down the things you’ve learned. The good times and bad. Remember what was successful and scratch the things that weren’t. When God gives you a dream… Fight for it! Stand for what’s right. Don’t give up or back down. When God gives you a dream… He’s given you purpose. Happy 1st Anniversary That Christian Girl! pssst! Did you hear the exciting news? We will be starting a new series in the upcoming months! Keep an eye our for In Her Shoes!